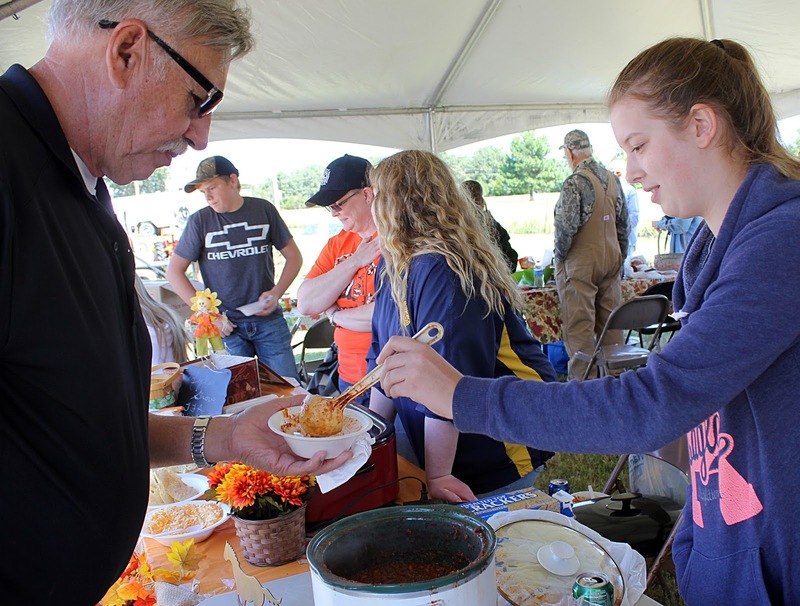 The aroma of spices and meat filled the air as the 10th Annual Road Kill Chili Cook-Off got underway on Saturday, Sept. 12, at the Delaware County Fairgrounds. The event, an annual fixture at the Delaware County Free Fair, drew cooks of all ages to create a pot of chili designed to win accolades. 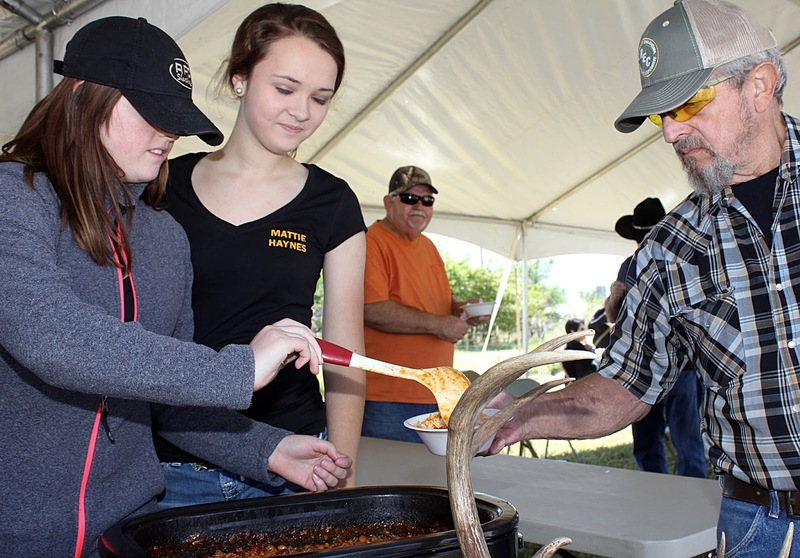 The competition, organized by the Jay Chamber of Commerce, was open to individuals, as well as businesses, non-profits and school groups. 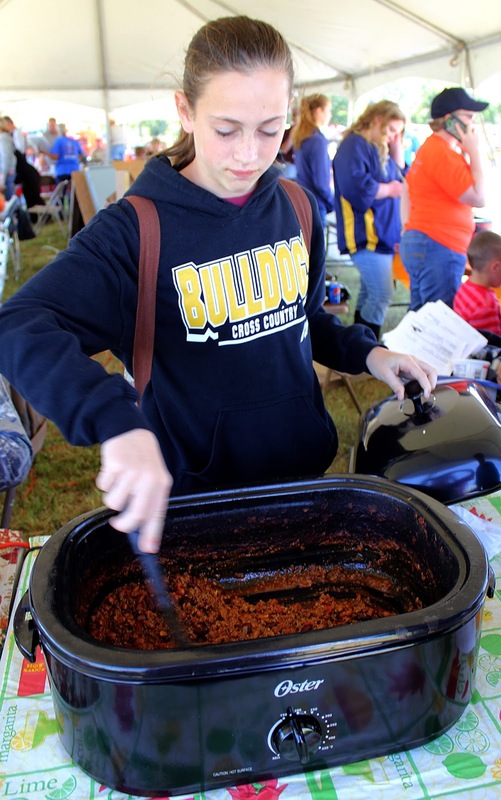 Saturday was Checota Sperry’s first foray into the world of cooking contests. A member of the Jay FFA, Sperry learned of the contest when her fellow FFA members began discussing the chapter’s entry. “I decided I liked to cook and I wanted to enter for the fun of it,” Sperry said as she stirred her crockpot of chili. It was the second year Grove FFA member Rylee Caswell entered the competition. 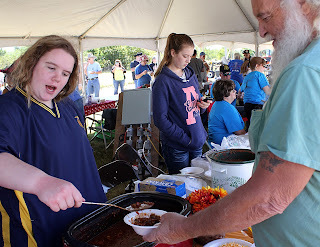 Caswell said her recipe was passed to her by her brother, Trent, and father, Tim, and is designed to be a sweet chili made with Blue and Gold products. Caswell said she continues to perfect the mixture. This year she added hatch chili peppers to her chili, to give it a different flavor. Farley won first place in the youth division. With five years under her apron, 13-year-old Lexie Farley was one of the youngest, and most experienced competitors at the event. Farley’s mother, Becky, joked that she began entering the cook-off before she was old enough to brown her own meat. Farley said she continues to improve her entry each year, adding and subtracting things in an attempt to create the perfect recipe. 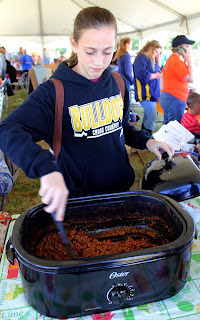 Ultimately, Farley said, being in the competition gives her a chance to cook chili often with her father, Butch. “It’s a daddy daughter thing, I’ve always done it with him,” Farley said. In the end, Farley walked away with the first place in the youth division, while Sperry took second. Caswell, representing Grove FFA, took second place behind Jay FFA in the school division. Best Decorated Table – Jay FFA. Best Overall Chili – Jay FFA. Business Awards: 1st - Grand Savings Bank-Jay; 2nd - Subway; 3rd - Bank of Grove. Church Awards: 1st – First Baptist Church, Jay. Individual Awards: 1st – Sarah Adams; 2nd - Beverly Buzzard. Youth Awards: 1st - Lexie Farley; 2nd - Checota Sperry. Non-Profit: 1st – Delaware County Historical Society. School: 1st – Jay FFA; 2nd – Grove FFA. Editor's Note: This story originally appeared in the Friday, Sept. 18 issue of The Grove Sun.